The Ludwig Accent Combo 5-Piece Drum Set gives you famous Ludwig quality in select wood shells. 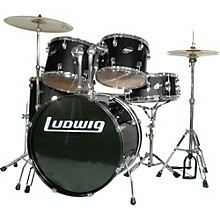 The drum set includes a matching wood snare. This set is stocked with a 22" x 16" bass, 12" x 10" and 13" x 11" toms, 16" x 16" floor tom, and a 14" x 6-1/2" snare-each with a wrapped finish. 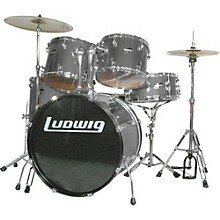 Hardware includes a Ludwig LA214FP bass pedal, snare stand, cymbal stand, hi-hat stand, and a throne. Maple and birch drum sets (drums only) - 3 year warranty. Marching and tympani drums - 3 year warranty. Sticks and hardware - one year warranty. Cases - one year warranty. Accent Drum line - one year warranty.